Finding healthy yet delicious and satisfying snacks can be a little tricky. I find meals super easy but snacks a bit more challenging, especially on the go - because taking a pot of hummus with carrot sticks around isn't exactly practical. This is why so many people reach for bags of crips or chocolate bars, they may be easy and mess free but they're not going to help you feel your best, they aren't loaded with nutrients and they can have negative effects on your health when eaten regularly. Linwoods Snackettes (cutest name ever, right?) are one of my favourite on-the-go snacks. There's a selection of 3 flavours - all gluten free, vegan and free from preservatives and artificial ingredients, they're filling, they're high protein, they taste great, they're mess free and they come in handy little packets that can easily be thrown in your bag or kept in your desk draw. Luckily, Linwoods Snackettes are becoming more available too as they're launching into Holland & Barrett stores! To celebrate this I'm sharing 3 serving suggestions for the Snackettes, 1 for each flavour - because they can be enjoyed on their own but they're also very versatile and are delicious paired with other foods too. The spicy tomato flavour is my favourite! 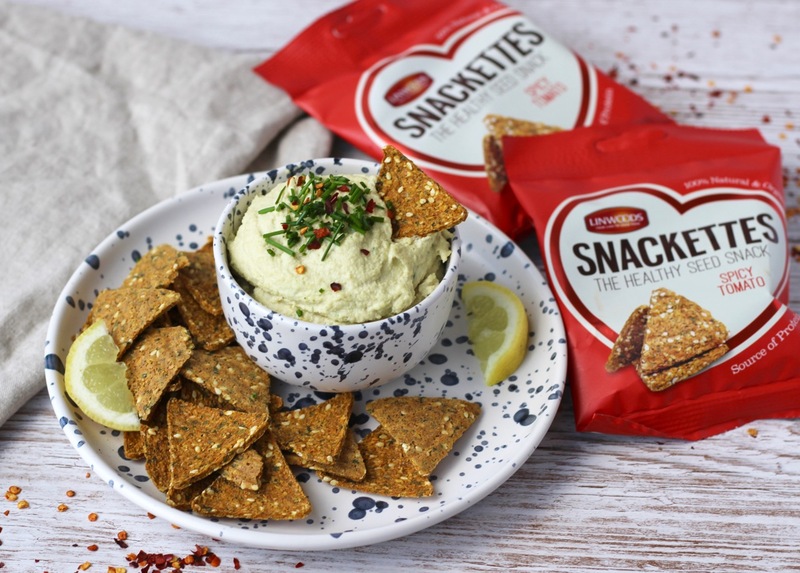 They're made with golden flaxseed, sesame seeds and spicy tomato flavouring (tomato powder, garlic, coriander, onion, sea salt) and are just such a yummy savoury snack. 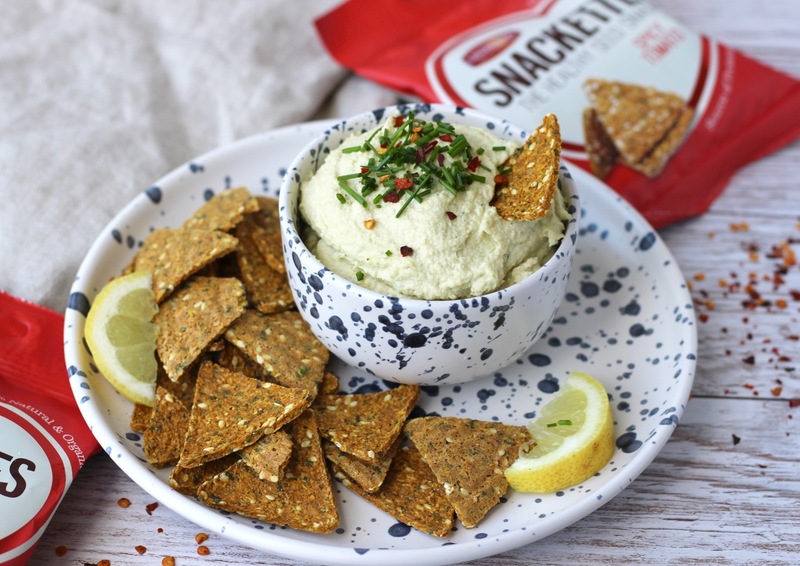 The spicy tomato flavour is a dream on it's own but my favourite way to enjoy these seeded snacks is with my homemade vegan chive cream cheese! The combination of spicy tomato and creamy chive cheese is unbeatable. 1. Soak the cashews in water overnight or for a minimum of 6 hours. 2. Drain and rinse the cashews then add them to your food processor along with all the other ingredients. 3. Blend until smooth and creamy. You will have to stop the food processor a few times and give the mixture a good stir and scrap down the sides. 4. Add to a serving bowl and dip in the spicy tomato flavour snackettes! The Super Seeds flavour is the most plain flavour of the 3 - it's purely a mixture of flaxseeds, pumpkin seeds, sunflower seeds, sesame seeds and chia seeds with no added salt, sugar or other flavourings. 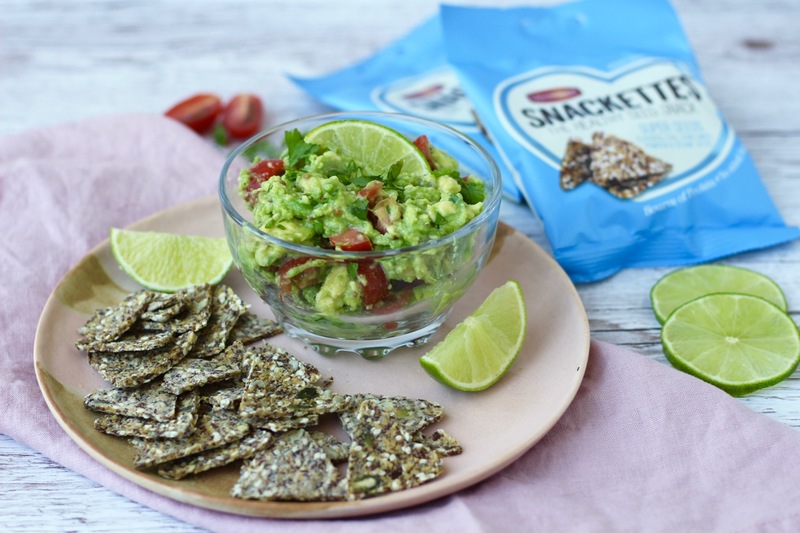 I love this flavour and think they're amazing dipped in hummus or my favourite, guacamole! 1. Cut the avocado in half, remove the stone and scoop out the flesh into a bowl. 2. Add the lemon juice and mash the avocado until smooth. 3. Mix in the chopped coriander, chopped cherry tomatoes and plenty of salt & pepper. The Banana & Coconut flavour is the sweet option of the three, which is perfect if you've got a sweet tooth like me! 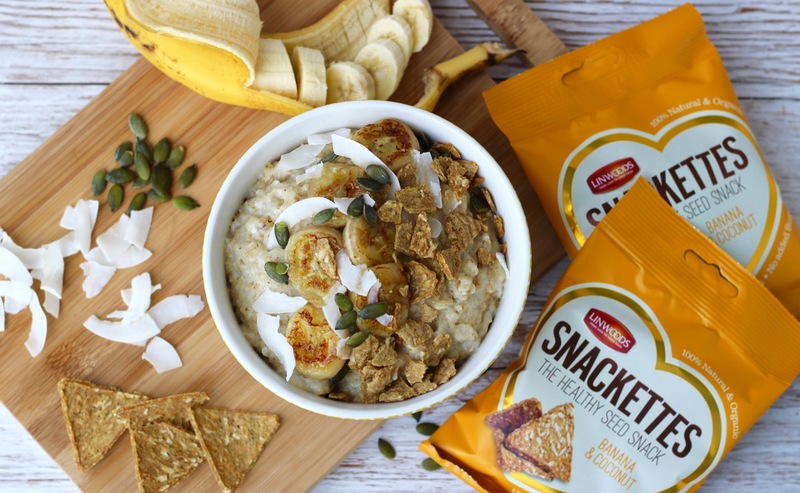 I love the banana & coconut flavour on their own, they're just so moreish and tasty but I also love adding these Snackettes to yogurt bowls or on top of porridge! I made this creamy bowl of porridge with caramelised banana and coconut shavings then crumbled up some banana & coconut snackettes on top to really add to that flavour and give an amazing crunch too! 1. First we're going to make the caramelised banana. To do this, simply cut the banana into chunky slices then add 1 tsp coconut oil to a pan over a low-medium heat. Once the coconut oil has melted place the banana slices into the pan. Cook for 3 minutes each side, until they're gooey and begin to caramelise. Put to one side. 2. Add the almond milk, oats and cinnamon to a pan and cook on a medium heat for 4-5 minutes, stirring regularly. Once your desired porridge consistency has formed pour the oats into a bowl. 3. 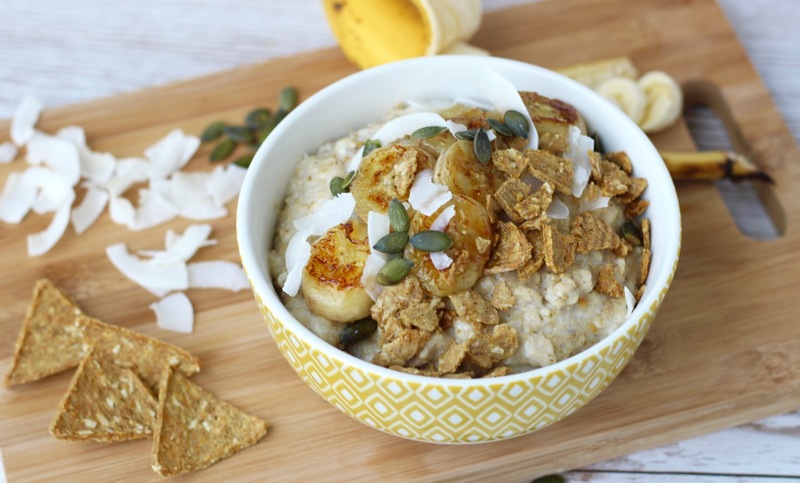 Add the caramelised banana slices on top of your porridge, along with the coconut chips, pumpkin seeds, crumbled snackettes and a drizzle of honey. Enjoy! As you can see, these super-seed snacks from Linwoods are not only the perfect on-the-go snack but they're a great accompaniment to many other dishes and sides! They're also great for Summer months with picnics or to snack on with plenty of dips at a BBQ. 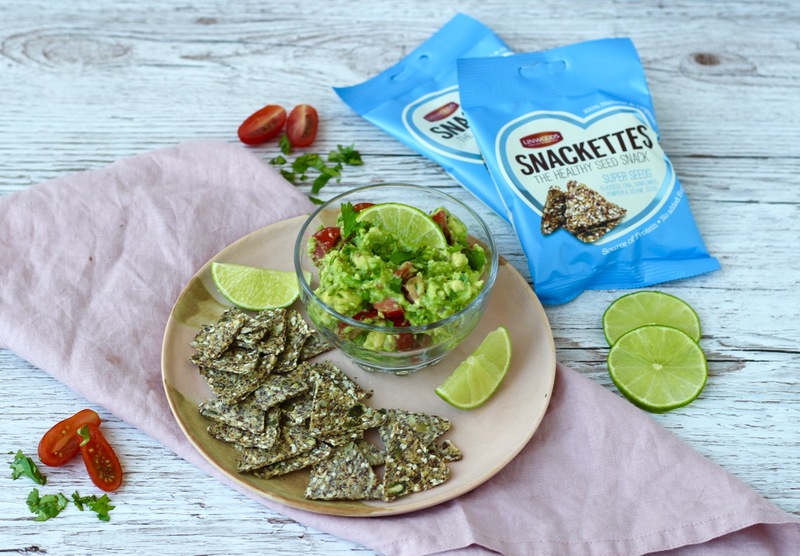 Linwood's Snackettes will be available to buy in Holland & Barrett this month and they're available to order from the Linwoods website now, as well as being stocked on Ocado and in some health food stores.